Enough is enough - the rallying cry from thousands of pensioners in the centre of Athens. Ahead of a vote next week on a new budget, the elderly say they cannot accept any more cuts in their pensions. They say they have already been subjected to 23 cuts, worth about 50 billion euros. 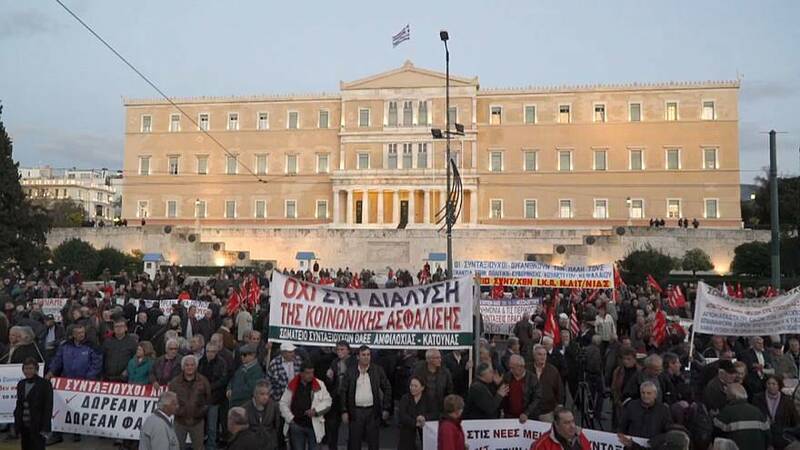 Euronews correspondent Ioannis Karagiorgas reported: "Thousands of pensioners from every corner of Greece came to Athens to demonstrate at Syntagma Square. "They say they can no longer suffer further pension cuts, reductions they say have destroyed their lives." One man told Euronews: "We can not let the government act out of control when it comes to pension cuts." Lefteris Dagianis, the president of a pensioners union in Evia prefecture, said: "People are suffering. They don't have anything to eat and they cry for help. "This can't go on. We're expecting more cuts. Are we going to reduce payments down to 300 euros?" While the governnent says austerity cannot be avoided, many of the pensioners taking part in the protest say their incomes have been reduced by up to 50 percent. They also say cuts in health care are having a devastating impact on the elderly.